Our Art Paper Pad is approximately 50 sheets of 17 1/2" X 22 1/2" heavy duty art paper (60# ve..
Our Art Tables are perfect for every young artist's "masterpieces"! 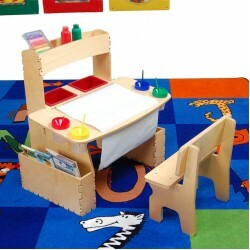 The Art Table includes two..
Our Preschool easel is specially designed for the half-pint Picasso. Great for pre-schoolers, or whe..
tural hard maple helps us create an amazingly durable child's easel, right here in our Minnesota woo..
Natural hard maple helps us create another amazingly durable child's easel, right here in our Minnes.. Built to last, Beka's Ultimate Double-Sided Child's Easel includes a built-in paper holder, pa.. Built to last, our Ultimate Double-Sided Child's Easel includes a built-in paper holder and tw..
Green or Black Chalkboard art surface, approx. 24" X 24", for the Deluxe or Ultimate Easels. T..
Our multi-level play space is a construction project, parking garage, helicopter pad, hospital or an..
You'll love our Drawing Desk. It's perfect for practicing spelling words and math problems, as well .. The Easel Maze Game fits perfectly on our Deluxe or Ultimate Easels. It hooks right over the t.. Designed to fit on full-sized easels. Featuring a support dowel at the top, the panel may be p..